We've all experienced brain fog—misplaced keys, forgotten facts, a general feeling that you're just feeling off today. And many of us will experience that "fog" manifesting as something more permanent—either in ourselves or our loved ones. It’s a step-by-step approach to better cognitive function—being selective about what's on your fork, what's in your environment, and how you take care of yourself can make a world of difference. With only one hour a week of practice, in 6 months, you can say goodbye to brain fog and welcome a better long-term memory and a sharper mind. TOM O’BRYAN , DC, CCN, DA CBN, is the author of The Autoimmune Fix and an internationally recognized speaker and writer on chronic disease and metabolic disorders. Founder of www.theDr.com, he organized the popular Gluten Summit in November 2013 and a second one in May 2016. Dr. O’Bryan has more than 30 years of experience as a functional medicine practitioner and is an adjunct professor at the Institute for Functional Medicine. He lives in San Diego. 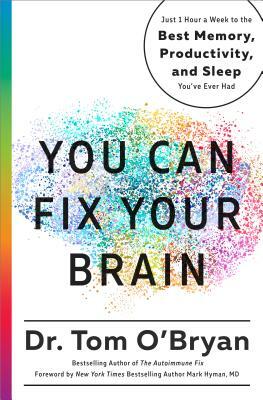 "Read You Can Fix Your Brain if you want to improve your memory, attention, mood, sleep, and productivity. You'll look back years from now and be grateful that you took care of your brain." “I’ve respected Dr. O’Bryan’s work for years and he hit it out of the park with You Can Fix Your Brain. He makes a compelling case for just how important the gut/brain connection is and gives practical advice on how to optimize the brain and mental health for the long term. I couldn't put this book down!"